The City of Powell intends to directly negotiate with contractors to develop a park on Seldom Seen Road. Powell City Council rejected bids at its last meeting for the 23-acre Park at Seldom Seen, located on the north side of the road and west side of railroad tracks. The bids submitted either exceeded the $3.4 million in available funds for the project or did not meet the bid specifications. The bids exceeded cost expectations because the schedule was impractical for contractors, said Jeff Snyder, Powell director of parks and recreation, during an Operations Committee meeting on Aug. 15. Proposed park amenities include five soccer fields, two playgrounds, two ball diamonds, a 13,000-square-foot indoor athletic facility, and a summer shelter with restrooms, according the city’s website. Snyder said there wasn’t much left to scale back without affecting the quality of the park. As a home-rule authority, Powell officials will directly negotiate with one or more contractors for the site and structural work. The city would like to start seeding the site this fall to have the park open in the fall of 2018. That deadline will be contingent upon potential contract negotiations, city spokeswoman Megan Canavan said. 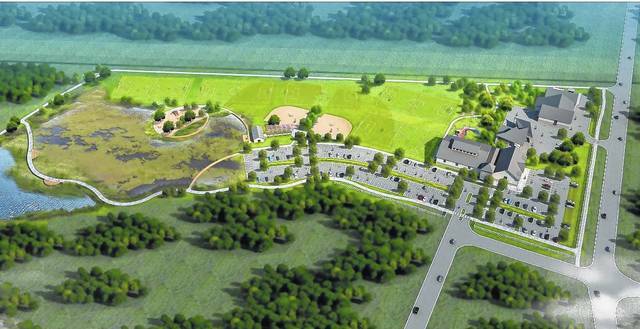 The park is the second and final project of a 2012 bond voters approved. The funds became available in 2014, but the city’s first priority was the Murphy Parkway extension, Canavan said. During the last five years, Powell officials worked on the park’s master plan and gathered public input. Other timing factors include three permits needed to clear the area, Assistant City Engineer John Moorehead said during the committee meeting. The city is expected to receive a permit for general construction by the end of August. But the two other permits are expected to arrive in mid-September, he said. Both are related to the disturbance of wetlands and clearing of certain trees in the area. Moorehead said the development will include the creation of new wetlands and clearing of certain trees. The city would need all three permits for the “cleanest operation” to clear the site, he said. At the committee meeting, Councilman Tom Counts said a negotiated contract would be the best approach. He said the bids received provide a benchmark on getting the best price for the park. Powell City Council will next meet at 7:30 p.m. on Tuesday, Sept. 5. The Development Committee will meet at 6:30 p.m. on the same day. The City of Powell is planning to develop a 23-acre site along Seldom Seen Road that will become The Park at Seldom Seen. Proposed park amenities include five soccer fields, two playgrounds, two ball diamonds, a 13,000-square-foot indoor athletic facility, and a summer shelter with restrooms, according the city’s website.